My love of woodworking began when I was a child, watching my grandfather refinish antiques. But life took me on a different path: medical school and a career as an emergency physician. Somehow, there was never the time I'd hoped to have for woodworking. All of that changed abruptly in 1996. After 15 years in the ER, I suffered a stroke which left my speech, reading and writing abilities severely impaired. At age 42, I was forced to retire from medicine. 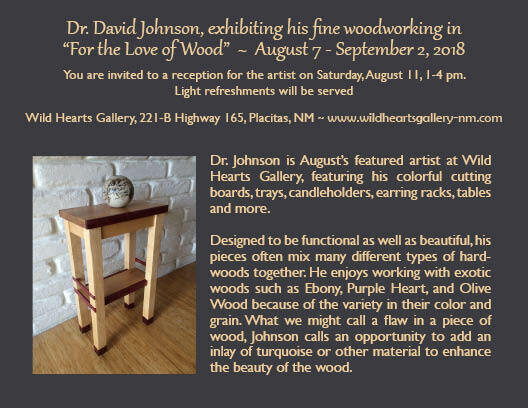 I took the opportunity my situation presented to build a woodworking shop at my Placitas home of 35 years. Although I came home from the hospital in a wheelchair, rigorous rehabilitation gave me back the ability to use all four limbs. Today, I am an avid skier and runner, and I've rebuilt my kitchen. I work in my shop using the table saw, joiner, planer and various sanders. Woodworking allows me a creative way to express myself. I enjoy working with exotic woods such as ebony, purple heart, and olive wood because of the variety in their color and grain. Each of my pieces are individually hand crafted and unique. My work is meant to be functional as well as beautiful. The cutting boards and trays are a colorful addition to any kitchen and my tables fit almost anywhere.